Being married is just like being in any other type of cooperative relationship. There are times one or both people involved are not too happy with the current situation. But because there are goals to be met (not just financial ones), each individual agrees to work past these incidents and continue the team effort. Okay, enough adulty, hoity-toity, therapy session talk. Lets, get down to the nitty gritty: Married life can be difficult. It can also be wonderful. Oddly enough, it can be both of these things at once. I’ve recently run into people that I haven’t seen in years. They ask how I am, how my family is doing, and if I’m enjoying married life. That last question always confuses me. I want to say, “Well, not always,” but I’m afraid they’ll take it the wrong way. My husband and I are what many would call “Happily Married”, but “happy” is such a relative term. We both work hard at making it work. We both appreciate what the other does. We both go out of our way to lift the other up. On the flip side – we’re both lazy, selfish, and can be overly demanding. You know why? We’re humans. Neither one of us is a super powered spouse whose every move is perfect and doting. We all have various forms of needs, wants, and outright tantrums. It happens. That being said, I wouldn’t give this up for anything. My husband is my best friend, my confidant, my support. He’s always there to make me laugh (especially when I don’t want to), listen to me even when what I’m talking about has no relevance nor substance, and I know that he will always be there if something should happen. And yet, being married usually requires sharing things. We share living space and sleeping space. We share utensils, technological gadgets, vehicles, and sometimes even clothes. We share the affections of our pets, our families, and our friends. Sharing can be very good. And sharing can be very frustrating. I have found that even in the most mundane of daily events, we have to stop and find the best way to do something for the team. Where do the kitchen utensils go and why? What is the best way to organize the filing cabinet? What kind of furniture should we get for the living room? We often spend more time than we should discussing (or compromising) the ways we do various, daily tasks. In the past, I made decisions on my own. I might hem and haw over them, or I might make them on impulse. Either way, I was the one who made the decision and it left me feeling empowered (or regretful). Now, we both make decisions. It empowers the relationship when we work together to find the best solution. And when we make the wrong choice, we both deal with the regret together. (Or both chime in to convince one another that we did the best we could). So if someone stops me to ask how I’m enjoying married life, I’m just going to smile and say, “Pretty good.” I know they may not understand, but that’s alright. The only other person who needs to understand, already does. 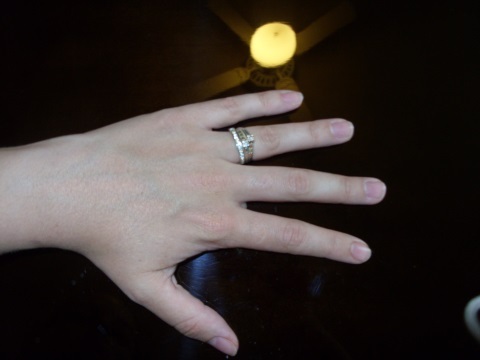 I was inspired by the Opinionated Man’s post about why he wears two rings to write about my two rings as well. Sorry about the picture, the surface was super shiney so you get a look at my ceiling fan too. Picture it: Christmas 2011, Family Christmas “unwrapping” event. Then the time comes for everyone to sit around the living room, basking in the beautiful lit-up tree, and start passing out gifts. I have to say that this is when I am most appreciably reminded about being apart of the family. My Mother In Law works hard to ensure that “all her kids” get the same quantity and quality of gifts. It makes this time of year even more special. I remember that we had opened our presents and were now digging into the stocking stuffers. I was handed my stocking and began bringing out of it candies and knick knacks that are to my taste. I love stocking stuffers because it’s a gift you get to enjoy NOW! I thought I was done with my stuffers until my MIL spoke up and said she thought there was one in the very bottom, at the toe. “Oh goodie,” I thought as I dug my way to the toe of the stocking, “more yummy candy!” I felt something hard and square and pulled out a ring box. I opened it and inside was a simple silver ring with smaller crystals around the middle. I looked at my then boyfriend and he said, “I’m sorry, Babe.. it was all I could afford.” I smiled, put it on and hugged him saying, “It’s perfect, I love it.” At that moment he looked into my eyes and said, “Then you’re really going to love the real ring.” He pulled another box out of his pocket and asked me to marry him. It was perfect. It was no easy feat, let me tell you. First of all, I’m allergic to all kinds of weird things: cloth that isn’t cotton, precious metals, and heavy duty pain killers. Okay, that last one might not be weird but it’s all I could think of to make three of something. At any rate, my then boyfriend had to search high and low for a ring that was a) pretty, b) not made of gold, and c) could withstand the torment I give to just about any object I own. He found a steel ring with gold accents on top, where it doesn’t touch my skin. I think it’s called Black Hills Gold. It’s gorgeous. On top of this daunting task, my now Husband didn’t know my ring size! He thought he was clever sneaking into my ring stash and taking just one out. Little did he know that he took my favorite one! I asked him for weeks where it was, who was in the house that might have stolen it, wondering if I had lost it at work.. I had my suspicions but they were put to rest as time went by. They were confirmed, however, on that wonderful Christmas Day. I usually don’t wear both rings like the Opinionated Man does, but whenever I look at the ring on my finger, I know there’s another one tucked away in my jewelry box that holds a special story and a beautiful moment.